I am not sure how controversial this post is going to be. I hope it will not be as much as my post on Adil Rashid. Below are the Test teams for 2018 given by ICC, Cricbuzz, ESPNcricinfo followed by the Test XI that I my index has churned out. My end of year analysis for 2018 can be found here. Before going into the details of the players. I have to state that these numbers reflect seven months of cricket due to the fact that I start my year based on the English season and not the calendar year. That being said I will definitely have the necessary data to produce and accurately compare the performances of the players in 2019 to what the experts pick. 1) Tom Latham: New Zealand have just begun their campaign and Tom Latham has shot into the picture. He has appeared in all of the teams above. 2) Dimuth Karunaratne: Karunaratne has clearly been the best opener so far. He has appeared in all of the teams above. 3) Cheteshwar Pujara : India must be ruing their decision to not including Pujara in the first Test against England. The first Test was won by England with a small margin of 31 runs. Pujara may have made the difference and changed the momentum of the series. The only place that Pujara has appeared is the ESPNcricinfo readers list and that too at number 5. Kane Williamson is the preferred number 3. He has not done enough to grab that position yet. Joe Root has played at 3 but he has made it clear that it is a position that he does not want to play in. 4) Virat Kohli : Number 4 could only go to one man. This of course meant that other batsmen like Joe Root and Kusal Mendis has lost out even though they have done well. Kohli would captain the side. 5) Ben Stokes : This may be a controversial call but it is one I am sticking to. Stokes has been batting at 5. He has shown he has the capacity to do it. He brings that extra magic into the side. Not forgetting that Stokes can be an enforcer. The other option at number 5 would be Angelo Matthews. However this side can bat way down to 8 so I do not think there will be any added benefit in playing Angelo Matthews. The general consensus is that Henry Nicholls should fill this spot. 6) Jos Buttler : The choice of the wicket keeper was an interesting one. I decided to go in for Jos Buttler because he has shown that he can keep at Test level. 7) Jason Holder : Holder has been the best all rounder. He has appeared in all of the lists. 8) Dilruwan Perera : This is one of the surprises my index. Nathan Lyon is the spinner of choice in all the rankings but he does not make it in my index. 9) Shanon Gabriel : The position of the third seamer seems to be the most divisive. My numbers have pointed to Shanon Gabriel. Pat Cummins and Rabada have not scored enough points as yet to make it into the top. 10) Mohammad Abbas : Abbas has bowled extremely well. He has deservedly featured in all of the teams. 11) Jasprit Bumrah: Bumrah has been a vital part in transforming India into one of the best bowling units. 12) Taijul Islam : I would Have Taijul Islam as the 12th man. He probably will replace Shanon Gabriel. Having him in the team increases the depth in the batting. At the end of the day, the proof is in the pudding. This is how the teams score. The Cricbuzz and Cricinfo readers XI scored low because of the inclusion of A.B. de Villiers. My main purpose in starting this index is the strong belief that the official ranking system used by the ICC is fundamentally flawed. My opinion has not changed even with the introduction of the ICC World Test Championship. I would say that it has made things worse. The real comparison will start when the championship actually begins. There will be the total points since the index began, the points for 2019, the ranking since the championship starts and the official rankings for the teams. There are six players that are in the ICC Team as well as mine. Pujara is in at 3 instead of Williamson because he has more points as a result of playing more matches. I also believe that Stokes is a better option than Nicholls. The choice between Pant and Buttler comes down to having a regular Test match keeper or another keeper who is a better batsman. Dilruwan Perera is currently higher ranked than Nathan Lyon. Shanon Gabriel is ranked higher on my ratings than Rabada. 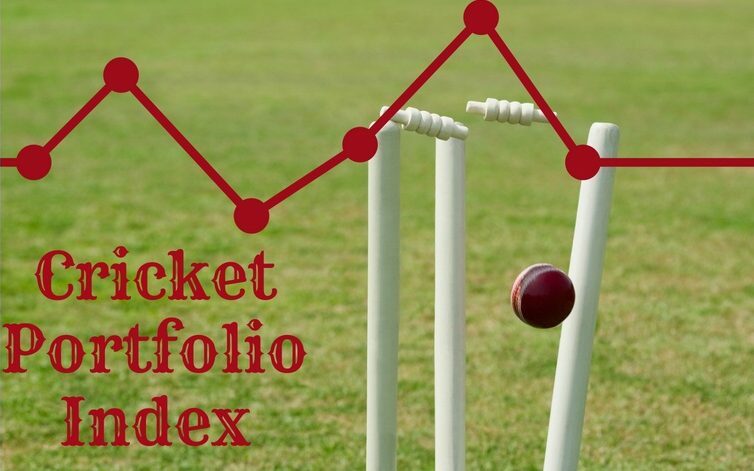 The Cricket Portfolio Index has demonstrated that it can pick not only the best players but creates the best team. Thanks for sharing, i normally don’t follow cricket but this was a very interesting post. How long have you been blogging? Thank you. I seriously started blogging in January 2018. I’ve been dabbling with blogging since 2016.